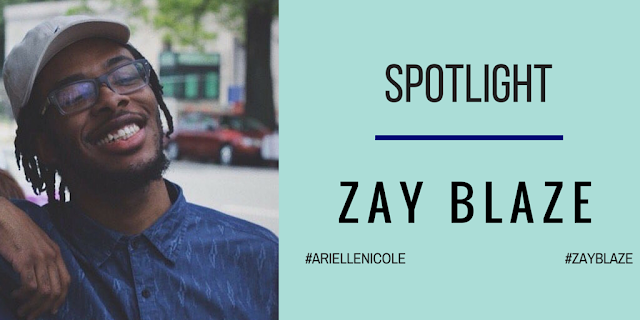 ATL-bred Zay Blaze loves music, and he's really good at making it too. Along with his creative partners, Zay is hoping to change the way we think about hip-hop. Not convinced that he can do it? Take a look for yourself and think again. Arielle: What is the Zay Blaze sound? Zay: That's a very good question. Mostly versatility. When you listen to Zay Blaze the singer, you can expect to hear a nice smooth sound to just vibe to and be caked up with your boo, but rapping you can expect to have to turn on your listening ears, 'cause there's a 100% chance I'm going to either be speaking a truth about society or rap, or delivering very subtle punchlines and wordplay. Z: A lot of people just place me in a "Drake" category being that I sing and rap but I like to think I'm more than just that. I would say I would fit into the lyrical, yet vibey category. I like to think I'm in the upper echelon of rappers (even though I'm not famous yet). A: Some of your most popular songs are about love and romance. How do you think that affects the demographics of your fan base? Z: Surprisingly, my fan base isn't only girls. A lot of guys actually love my music too (even the love songs) because I guess they see someone trying to come up that isn't afraid to say that he loves a girl. But my fan base is mostly female because of my smooth voice. A: How would you describe the current state of hip-hop? Z: Currently? Boo-boo, mostly because everyone just does the same diluted thing (glorify trapping/or being a fiend over a trap beat and auto-tuning very one dimensional and unclever lyrics) but there is an oasis of true hip hop still out there, who still talk about real things, and I'm just hoping people realize what real hip hop is soon. Z: Well for rapping, they would be Joey Bada$$, Chance the Rapper, Drake, Mick Jenkins and Nas. For singing, they would be Frank Ocean and PartyNextDoor. Z: One? Just one? That's really hard [laughs]. If I had to pick just one it would be PartyNextDoor. Not only would our sounds mesh perfectly, but also he's a producer just like me, and I feel like he could show me a lot when it comes to sound design or sampling. Producing with him would give me better insight to the mindset of PND. A: What's it like to be an artist at THE Hampton University? Z: I actually love the Hampton experience, you get a lot of connects there; Hampton has so much untapped talent like 4AM/Chef Jimmy, Jaims, MoThoro, Yahieness, Mickey, and more that are all on the cusp of a big break, and I'm very proud to be amongst these other talented artists. It's also nice to go back home and work with artists like Kapsure, Azzan Jair and my squad GetLitBoyz and kinda be the bridge between the artists at home and the Hampton artists that are spread out all over the country. Don't sleep! Follow Zay Blaze on Twitter and IG.